After a successful series in 2017, GKIDS and Fathom Events continue their collaboration to bring a new line-up of treasured films to U.S. cinemas throughout 2018. STUDIO GHIBLI FEST2018 gives fans an opportunity to see nine of Studio Ghibli’s revered animated masterpieces on cinema screens nationwide, along with some very special surprises for Fathom Events attendees only. The 2018 series kicked off with the 10th anniversary of the heartwarming family adventure “Ponyo,” from Academy Award®-winning Hayao Miyazaki, for three days on March 25, 26 and 28. 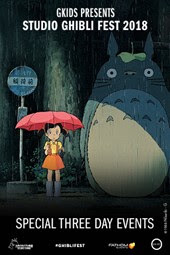 Tickets for STUDIO GHIBLI FEST 2018 can be purchased online by visiting ghiblifest.com, FathomEvents.com or at participating theater box offices. Moviegoers throughout the U.S. will be able to enjoy these events in over 700 select movie theaters. Weekday showings begin at 7:00 p.m. and Sunday showings begin at 12:55 p.m. (all local times). When Sosuke, a young boy who lives on a clifftop overlooking the sea, rescues a stranded goldfish named Ponyo, he discovers more than he bargained for. Ponyo is a curious, energetic young creature who yearns to be human, but even as she causes chaos around the house, her father, a powerful sorcerer, schemes to return Ponyo to the sea. Miyazaki’s breathtaking, imaginative world is brought to life with an all-star cast, featuring the voices of Cate Blanchett, Matt Damon, Lily Tomlin, Liam Neeson and more. “Porco Rosso” is a world weary flying ace-turned-bounty-hunter, whose face has been transformed into that of a pig by a mysterious spell. When he infuriates a band of sky pirates with his heroics, the pirates hire Curtis, a hotshot American rival, to get rid of him. But with the help of the teenage girl Fio, an aspiring airplane designer, and sultry lounge singer named Gina, Porco takes to the skies for what may be his final high-flying showdown. Fathom Events is the leading event cinema distributor with participating theaters in all 100 of the top Designated Market Areas®, and ranks as one of the largest overall distributors of content to movie theaters. Owned by AMC Entertainment Inc. (NYSE: AMC), Cinemark Holdings, Inc. (NYSE: CNK) and Regal Entertainment Group (NYSE: RGC) (known collectively as AC JV, LLC), Fathom Events offers a variety of one-of-a-kind entertainment events in theaters such as live performances of the Metropolitan Opera, top stage productions including Newsies! The Broadway Musical and George Takei’s Allegiance, major sporting events such as Mayweather vs. McGregor, epic concerts with artists like Grateful Dead and Dixie Chicks, the yearlong TCM Big Screen Classics series, inspirational events such as Steve McQueen: American Icon and In Our Hands, and beloved anime titles like Princess Mononoke and Spirited Away. Fathom Events takes audiences behind the scenes for unique extras including audience Q&As, backstage footage and interviews with cast and crew, creating the ultimate VIP experience. Fathom Events’ live digital broadcast network (“DBN”) is the largest cinema broadcast network in North America, bringing live and pre-recorded events to 897 locations and 1,387 screens in 181 DMAs. For more information, visit fathomevents.com. Studio Ghibli was founded in 1985 by animation directors Hayao Miyazaki and Isao Takahata and is one of the most successful and well-respected animation studios in the world. Cultivating a creative force of talented directors, animators, and storytellers under the revered brilliance of Miyazaki and Takahata, Studio Ghibli’s films have been praised for their originality, dazzling animation, and epic storytelling. The films have become a beloved part of Japanese popular culture, and have garnered worldwide acclaim from audiences and critics alike. Hayao Miyazaki’s Spirited Away won the Academy Award® for Best Animated Feature of 2002, and in 2005 Miyazaki was named one of “the most influential people” by TIME Magazine.